After almost ten years living in Portland, I still hadn’t trekked up Mt. Tabor for the PDX Adult Soapbox Derby that happens every August. 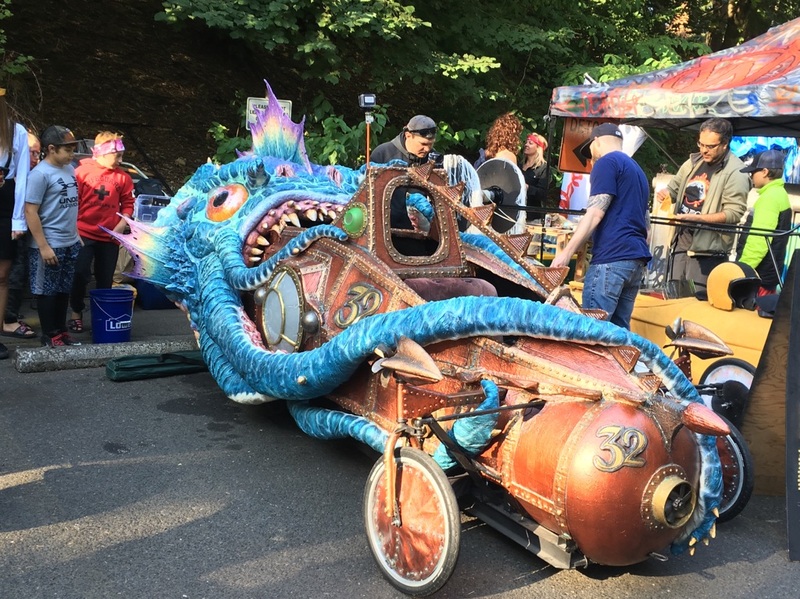 When I found myself surrounded by homemade, hill-powered vehicles, decorated with handcrafted flair, I wondered what had taken me so long. Distractions aside, my mission was to find Dash. For the sake of his reputation as an educator, we decided on identifying him with one name only. I found him adding the number 18 to various places on his car. 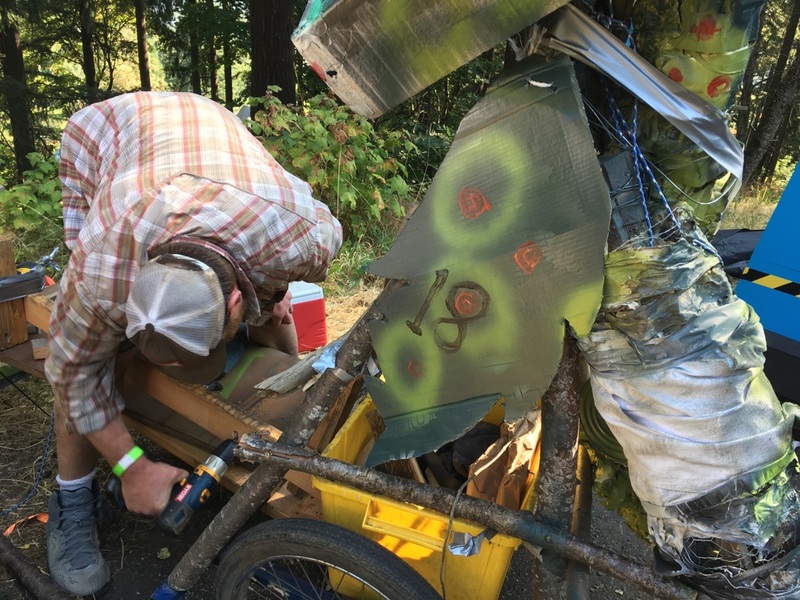 Later as he applied duct tape to his towing bolt he pointed out, “I don’t want to annihilate myself should I get launched forward.” This was my introduction to the rough and tumble world of Adult Soapbox Derby. While walking through the pre-race area, I overheard, “At some point, it would be nice to have a cute little car that’s easy to unload.” This didn’t seem likely as the cars I saw were large and complex, some with multiple riders and they all had to be hauled up Mt. Tabor. Walking through this area was a blast. People milled around chatting and taking photos while teams were getting their cars ready. I enjoyed the outlandish car designs and costumes that fit the car’s themes. 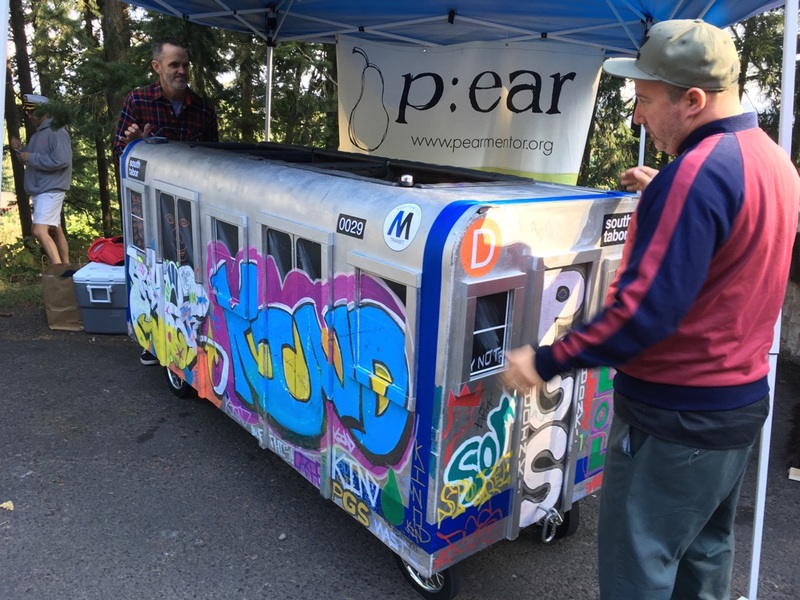 One participant, who had one of two New York City subway inspired cars, described his vehicle as a tribute to the world’s greatest living museum, the NYC subway trains of the 70’s, 80’s and 90’s, when they were covered with graffiti. 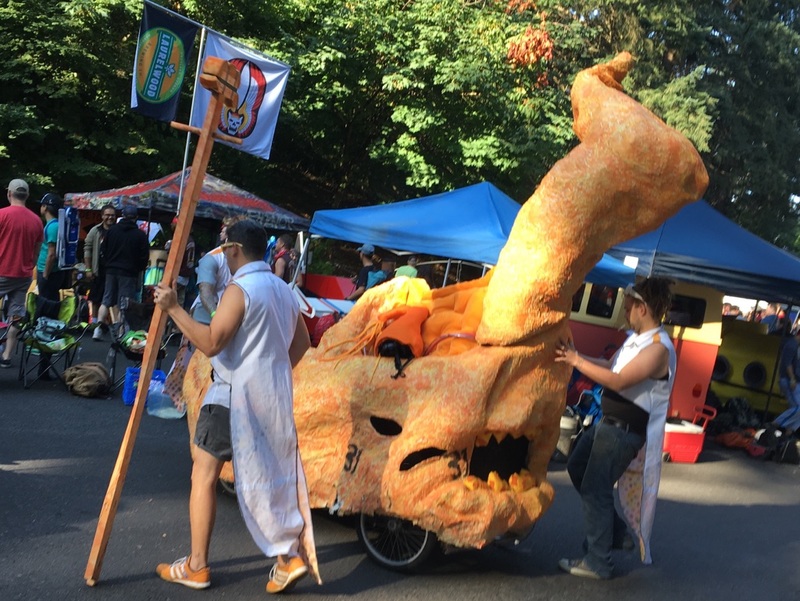 People’s enthusiasm for the PDX Adult Soapbox Derby was infectious. Dash was waiting to have his car inspected. A check-in person had already come by to let him know he had dropped his Tupperware and a stick when he was bringing his car up the hill. The inspection process proved how organized the event was. There were volunteers in all kinds of capacities, one even had me sign a waiver when Dash drafted me to help push his car at the starting line. The inspector stopped by and expressed concern about the condition of the cords Dash used in his brake system. He suggested replacing the cord. Dash worked on his brakes while telling his Derby history. He started as a pusher, pushing for eight years. 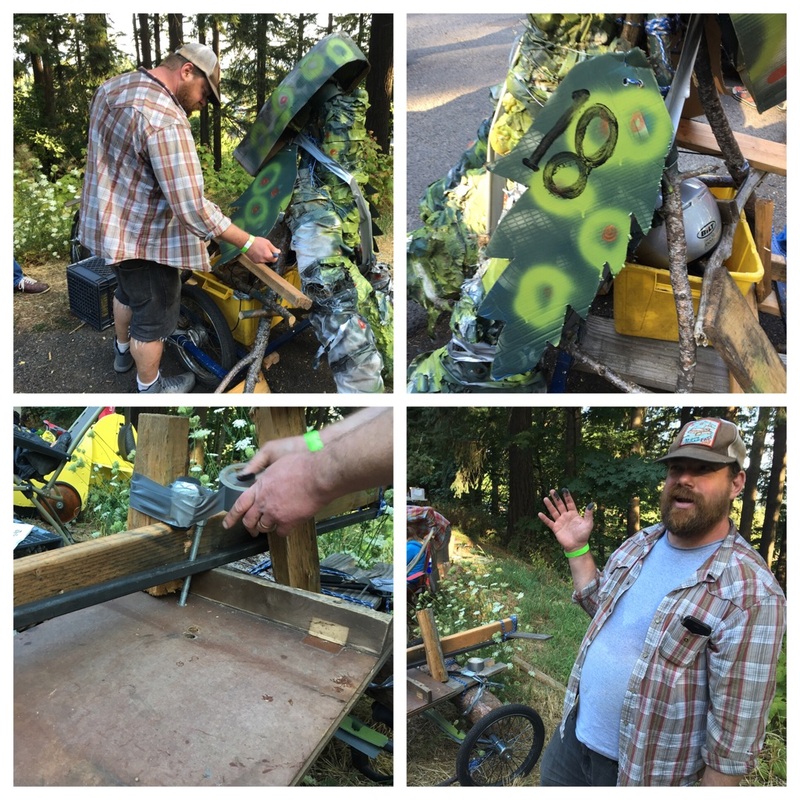 One of the teams he worked with was called Toe Cutters. “Someone gave us half a car and that’s how it hatched,” Dash said explaining how he went on to build his own car and race for the last four years. Dash’s current car is named Kon-Tiki. The name was inspired from the Norwegian explorer and writer, Thor Heyerdahl, who built a raft of the same name in the 40’s to research whether people from South America may have been able to travel to Polynesia by sea and settle there. “This one is an entire new rig,” Dash pointed out. Logs were incorporated into his craft to “raft it up.” Papier-mache formed the basis of the toothless dragon motif. “It’s all part of the mystique. You gotta keep it a little weird,” Dash explained. The chassis of Dash’s car included two 2 x 4’s, assorted lumber and vintage moped wheels in the back where the cord was pulling drum brakes. 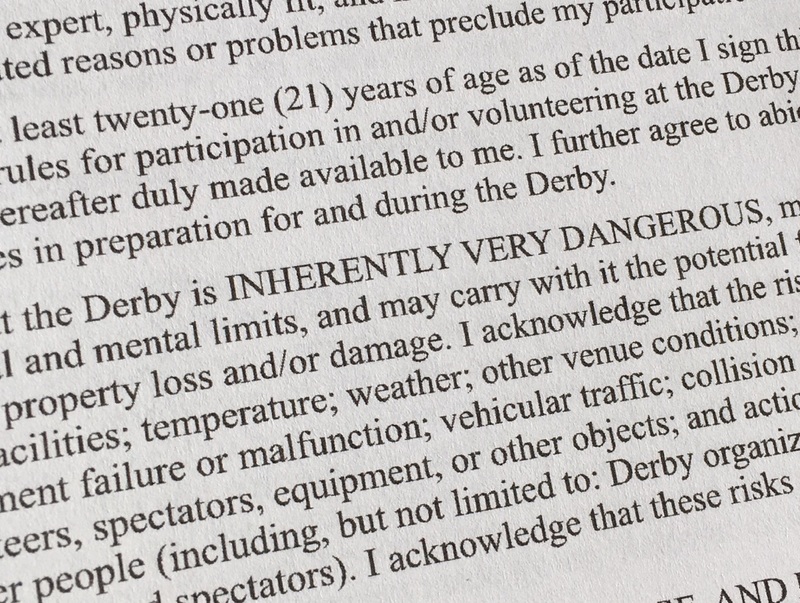 The Derby is a social event as much as a race. 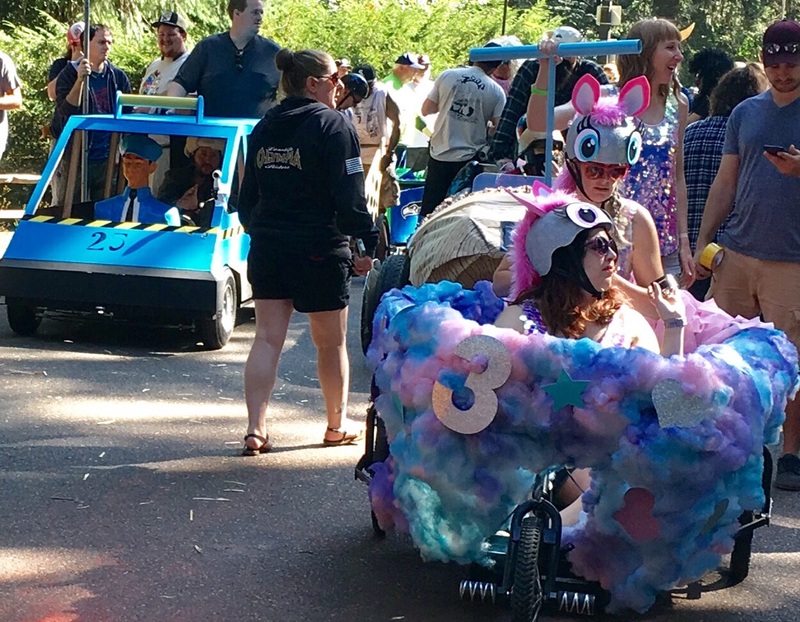 Cars ride three to a heat until the fastest Soapbox Derby car is crowned. Participants fill out a ballot sheets voting on various categories for more accolades. There’s plenty of opportunity for people from racing teams with long histories to hang out at an event ending party. The inspector wasn’t accepting Dash’s cord brake system. My scatter shot notes revealed his comment, “you’re trying to die this year.” The inspector remembered the front wheel disc brakes Dash had used for his car the year before which had been decorated with a cow theme. “What’s all this?” The inspector asked. Dash explained his steering which employed raft-like push sticks for each wheel. Dash’s last minute brake inspiration involved rigging up a bar attached to a steel rod in an attempt to stop the back wheel. Dash drilled a hole into one of the boards of his car. “Hey Phil want to see if this thing comes through when I whack it,” he asked one of his helpers. The inspector had one more look at Dash’s brake addition seeing if the wheel would stop as people pushed the car. I was amazed by Dash’s dedication and willingness to drive his car without foolproof brakes. “I can’t give you a go,” the inspector said. They shook hands. Dash accepted the disqualification. “It’s gonna be a good day regardless of whether you’re racing or not,” he said. Later he offered his services as a driver to a neighboring car, hunted down some screws to help another team and loaned out his bike pump. As for race watching, the trick seems to be finding the right spot. Cars at the starting line begin slow and then scurry past. A man was telling his kids about “blood alley,” a name that could only be derived from frequent wrecks. I didn’t stay for much of the race vowing to return next year. I left appreciating the flamboyance of the car exteriors more than their racing ability. Dash shared what it’s like to ride the mile long track that twists and turns down Mt. Tabor. While cars approach speeds of 50 miles an hour, Dash warned of the dangers of the “speed wobbles” that eat many cars and joked about having an “aim for the haystack” racing philosophy. He’s experienced first hand the hazards of dodging disintegrating cars. The importance of brakes in Adult Soapbox Derby car design cannot be overstated.